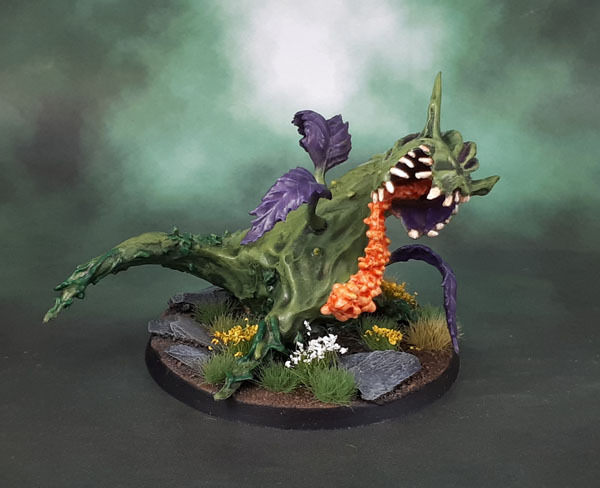 Reaper Bones 77505: Dragon Plant (#Monstermarch3 ’19, Gender-Ambiguous March ’19) | Azazel's Bitz Box. 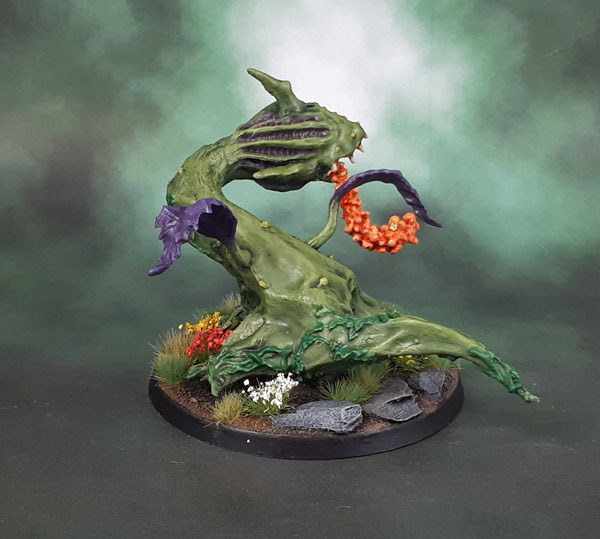 Finally, I’ve managed to complete the third of the three weird carnivorous plants from the Reaper Bones Kickstarter set that I got a few years ago. As with a few other models, the Gender-Ambiguous Challenge got me working on it again, and Swordmaster of Hoeth’s Monster March got it finished (on the 31st, no less! 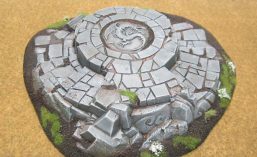 – though with the basing completed yesterday). Not a whole lot to write about the painting scheme here – I pretty much copied the same colours that I used on the Death Star Lillies a year ago, again using almost exclusively Reaper’s HD paint line. Since those apparently can manage to stop Bones models from degenerating into a sticky mess. Of course, I also have to dedicate this model to John from Just Needs Varnish, who seems to have a bit of an unnatural attraction to these plant models. I’m now all out of models from this range to paint! I’ve photographed the Dragon Plant alongside the Death Star Lillies (who names these bloody things? I guess it’s probably another Not-D&D Monster?) as well as a Space Marine. These will go nicely next to the various bits of Deathworld Fauna and provide some nice Deathworld Flora! This entry was posted in Dungeons & Dragons Monsters, Reaper Miniatures, Sci-Fi Gaming and tagged Reaper Bones 77505 Dragon Plant. Bookmark the permalink. I wish these were real plants that I could plant in my front yard. They’d certainly keep your place safer from intruders and/or nosy neighbours! Love that – great colour choices mate! Thanks Alex – just followed on from the little Lillies last year. Beautiful plant, given that it will eat you. Nice Azazel! A not quite Easter lily? The timing is right, at least! I have to admit, I can’t recall what I was talking about at this point, but my mind’s been a muddy mess for the past week or so… I’ll point it out when I remember it! Now that is great, really weird looking but great all the same, make “Triffids” look like wimps! I guess this Dragon Plant is pretty inspired by the Triffids. Surprising really that there are not more Not-Triffids out there in the miniature realm..
I’ve never painted any bones figures- what’s the deal with the stickiness then? I don’t know, to be honest. Something about the material, I’d guess leeches through layers of paint and even varnish – which can leave the model sticky. Reaper have never come out and explained it, and their forums are filled with people doing workarounds (and a few too many water-carriers). I had something similar when I tried to paint the plastic figures from the Zombies game- must be the same sort of material- at the time I put it down to the homemade wash I used. It could well be. The problem is all we are really told with any of them is “it’s high quality PVC”. The CMON Boardgame minis I’ve been working with lately are a few years old now, but paint up like a dream. Thanks for the mention! I just think these are great and you’ve saved the best ’til last! What’s not to like about games that let you use carnivorous plants? Welcome, mate – and Go Rogue Trader! Cheers, Dave! I’d like to get some more interesting (non-Bones!) Alien plants to go alongside. Armorcast does a few pretty good ones, or at least, they did. Haven’t looked at their site in a while, don’t know what’s still in production. I guess even if AC is doing them, that’s still only one place when you’d expect them to be done by a few people. Crooked Dice in particular come to mind..
Rawr! I approve of Dragons in any form, animal, vegetable, or mineral. The purple to contrast with the green is a nice touch here, as are the little bunches of flowers on the base. Thank you, Alexis. 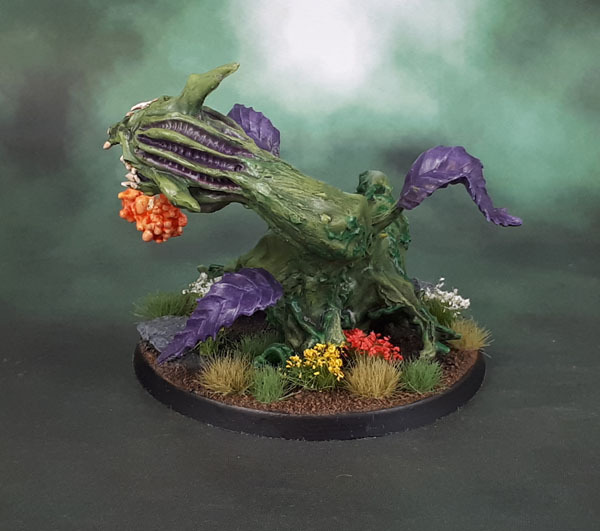 I thought (on the lillies) adding flowers and tufts made them a little more flexible to be used as either terrain pieces or as “monsters”, and again on this larger one – it fits them well, I think. Interesting piece and very nicely done, can’t say I have seen something like that before.